It is an image etched in the minds of a generation: Ronald Reagan perched atop his horse, riding the dusty trails through the canyons of his California ranch with his beloved wife, Nancy, at his side. But what most of us did not see was the man who always rode just a few steps away. John Barletta was an army veteran and Secret Service agent who spent over a decade with the Reagans, poised to give his own life at any moment to save the 40th president of the United States. His superior riding skills made Barletta the perfect choice to protect Reagan during his frequent visits to the ranch. Over time, he got to know Reagan as few others did. But what did these two men talk about during their long solitary hours on horseback-and how did they become the unlikeliest of friends and confidants? If you like learning about Reagan, this is definitely a must. This book created a different view on Reagan’s life. 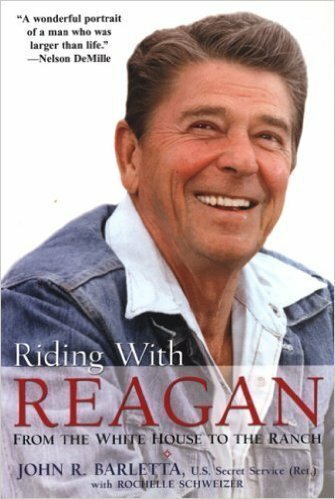 The author is a secret service member who rode horses with Reagan, so the book goes into more depth of Reagan’s life at the ranch. It also talks about the secret service which I found quite interesting.